Although not necessarily looking like the oldest member of the band, Lawton is the elder “Lad” of the BeatLads. Age is more how you feel than when you were born, though, so Lawton is probably really still quite a bit younger at heart (like, thirteen or something…) than in body. So Lawton got a guitar for his 13th birthday (a Univox 3022 acoustic) and thus it began. An electric guitar for Christmas (a Fender Mustang) a few years later continued to feed the smoldering musical passion (har har). But Lawton was drawn more to other pursuits in those days (football and females) and devoted little real time to guitar. An abortive attempt, along with brother Kevin, at forming a band (to have been named “Starfire”) with some friends from south Alabama (Clark Chesser and Rick Heisler) was the nearest thing to any organized musical participation for Lawton (other than high school mixed chorus). “Starfire,” interestingly enough, had begun as an “air guitar” lip sync band that exclusively “played” – you guessed it – the music of the Beatles. In an appropriate foreshadowing of what was to come, Lawton played “John” and Kevin played “Ringo” in the air guitar band with Clark (George) and Rick (Paul). Brother Kevin during these years – parenthetically – was honing his considerable percussion skills with the award winning Model High School band (Rome, Georgia). With Starfire never really getting off the ground the guitars went into the closet for a decade or so, until Lawton got involved in church youth ministry and in church camp leadership. Guitars are, of course, required in such settings, and one thing led to another. Lawton began singing and playing with Jamie Glass (the “Paul” Lad of the BeatLads) in the early 1990s at Forest Lake UMC in Tuscaloosa. The local church leadership expanded to conference (area) level leadership in the camp (Sumatanga) setting, and Lawton’s and Jamie’s love for the Beatles bled over into the camp musical repertoire, which grew into the BeatLads “project” in the early 2000s (see the website’s “History” section for those details). The smoldering musical passion is now no longer smoldering, but in full flame. Lawton’s love for guitars, for acquiring guitars, for trading guitars, for buying and selling guitars on Ebay, etc., approaches mythic stature (humor, of course). The guitars of Beatles are, naturally, the guitars with which Lawton is most interested. Lawton owns or has owned nearly all of the guitar models used by John Lennon and George Harrison, and these are the guitars that you will see played by the BeatLads on stage. 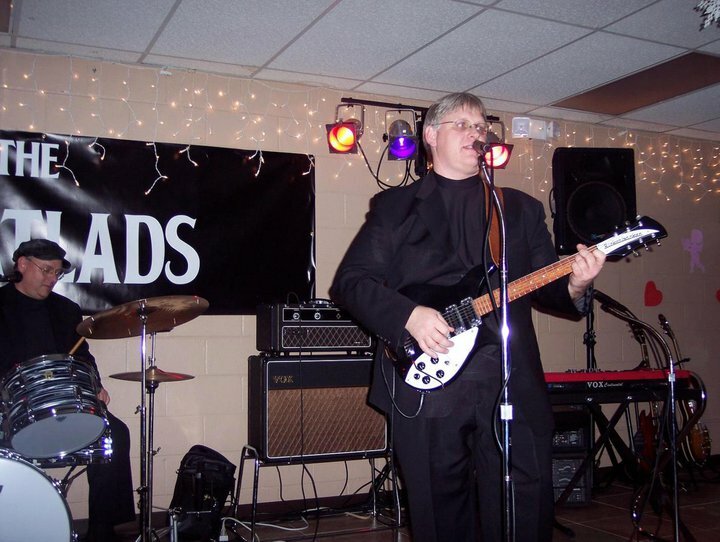 Performing and bringing the Beatles’ music to life again in a live musical setting is one of Lawton’s favorite things.